Please email me to book a consultation. It's important that you feel I am right for you so I offer a free 30 minute phone/zoom consultation. I am a Shamanic therapist, healer and teacher. The Completion Process perfectly aligns with my shamanic work, as Teal has said, this is ultimately a Soul Retrieval. I am also a qualified Reiki & meditation teacher and hold a BA in Cultural Anthropology. I am currently in on-going training as an Ayahausca healer (curandera) & Psychotherapist. I have been working as a professional holistic therapist for 5 years now but have 15 years experience in energy healing. 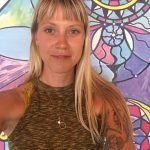 Having been through a deep and extensive healing journey of my own, I am able to empathically connect and provide compassionate intuitive insight as well as draw from a wide range of skills and techniques. I've been treating people with the Process since Feb 18, and it's taken over may business now as the most popular treatment, because it works! And I am so excited and privileged to be a Certified Practitioner and share this powerful healing process with you.